Biting is NOT an acceptable behaviour and it should NEVER be an acceptable behaviour because it means that you are pushing your bird too far. It doesn’t mean your bird is mad at you or mad at someone else or any of those constructs (labels) that humans like to place on our bird’s behaviours. All it does is get a bird rehomed and I know that many of you now have rehomed birds in your care. The best predictor of future behaviour is past consequence. This means that if your bird “learned” (and biting IS a learned behaviour) to bite in a previous home and that worked to get the bird what he/she wanted, then your new bird will use it again when placed in a situation where choice has been taken away. If you take the time to learn the skills necessary to implement behaviour change, biting will become a thing of the past. If caregivers really understood why their birds bite and that it is within their power to prevent it from happening in the first place, they would be lining up to learn how to do that, right? Well, the answer is no they aren’t, because they are still in that mind set that it is intrinsic to the bird or that the bird is bad or they say it is because of the bird’s hormones, or was unprovoked or a myriad of other excuses that put the blame on the bird instead of on us where it belongs. Biting is human error. Simply and unequivocally and each time it happens and we “accept” it, it increases the likelihood that it will happen again and again. Each additional time you “accept” a bite just reinforces the unwanted behaviour until you begin to hate the bird and before you know it the bird is relegated to a cage in a closet or the basement or to a new home. Doesn’t it make more sense to stop it before it gets out of control? Now I don’t know about you but I’m not all that keen on having a beak with a body attached to it up to its eyeballs in my flesh. I’ve been on the receiving end enough times to know but that was before I learned about ABA (against biting always or applied behaviour analysis). I am not saying I never get bitten anymore because I am human and I make mistakes and that is the key, it is my mistake, not my birds. One of the first things you need to do when you have a bird that bites is to stop placing yourself in a position where your bird is able to bite you. Then you need to figure out what sets the occasion for the biting to happen and what is the bird getting out of it. I don’t often get bitten anymore but when I do, the first thing I do is ask myself, “why did she do that, what was going on immediately before the bite and what happened immediately after the bite. All behaviour has function so that means just because you can’t figure out why your bird bit you, does not mean there wasn’t a reason. There is always a reason and once you figure out what it is, you can change it. All 4 of my birds had learned how to bite at one time or another. I adopted Zazu before I learned about ABA. She would bite when I tried to get her to step up. When she refused and I should have allowed her to make that choice but being the control freak I was, I had to make her step up. I ended up with hands that looked like hamburger meat and the desire to rehome her which is something I hate. When you take an animal into your home, it is your responsibility to take care of them to the best of your ability. Animals that are well behaved aren’t born that way; we have to teach them acceptable behaviours or how to succeed in our homes. Well, I taught Zazu how to bite and that really wasn’t working for me. I heard about this new on-line behaviour course and figured I better take this because if I don’t, I’m going to need a blood transfusion. I took the course in April 2004 and it changed my relationship with my birds forever. I adopted Gypsy in December 2004 and she was my first ABA bird. From the moment, I brought her home I set out to apply the techniques I had learned from the course and it was a complete and total success. Read The Bird and the Bank Account for Gypsy’s full story. Sally started to bite me when I asked her to step up to go to bed. This one stumped me but I kept trying and at the end of the intervention you must always monitor the results because if the behaviour is maintained or increases, it is still being reinforced and seriously, we want to stop reinforcing the bite, OK? At least, I did because those beaks are really, really strong. Over a period of 6 months (yes, that’s how long it took me to figure it out), I tried everything. I changed the order I put them into their sleeping cages, I practically jumped through hoops and in the end, I learned that 1. I wasn’t spending enough time with Sally and she was telling me (I must have ignored her subtle attempts at communication) I don’t want to go to bed right now; I want to be with you. I simply increased our one-on-one time (we are talking 10-15 minutes), gave her a pine nut (her favourite primary reinforcer) once she stepped up for me and I haven’t looked back. It was smooth sailing as soon as I figured out what set the occasion for the biting to happen and so I changed our night-time ritual to give Sally what she needed (my attention) so that I got what I needed (my blood). LOL The consequence for Sally, when I asked her to step up was to be put to bed and knowing me this was most likely the only time I asked her to step up during the day. We must all get away from doing that. If the only time you ask your bird to step up is when you want them to do something they do not want to do, eventually it will backfire and they will refuse. If we insist verbally and then physically, we are going to get nailed and that happened to me more times than I can count. It worked for so long but then Sally decided one day that being put to bed was not reinforcing and of course, when that foot doesn’t come up, you need to back off. I did not do that and I inadvertently taught her to bite. You can bet I paid attention then. Now isn’t that sad that I pushed her into that position. So much for being the intelligent species. Gypsy had learned how to bite in her previous home. She had given up all attempts at communication and immediately went to the bite. I was warned about this behaviour so I knew exactly what I needed to do. Fortunately for me, Gypsy is extremely food motivated. I learned (very quickly) several things about my Gypsy girl; she did not like me to touch anything in her cage while she was in there so I didn’t. How easy is that? If I needed to do anything with her cage, I did it when she was in bed in another room. I also learned that I needed to respect her rules. For example, when I need her to step up when I am going to work in the morning, the consequence/treat for requested behaviour is a head scratch. Gypsy dictates the acceptable amount of time. When she is ready she will put up her foot. If I stop before she is ready, she simply will not step up and if I were to push it, she would bite me and that just doesn’t work for me anymore. She makes the choice and it works for both of us. Bedtime is a little different. At 8:15 pm, I start to get the birds ready for bed. Gypsy is now on 3 medications every day so the birds all get some organic baby food in a syringe. This comes in handy when I need to medicate the birds as I do now with Gypsy. She takes it without a problem and actually gets excited (chirps, steps back and forth repeatedly on her perch) when she sees the syringe. This definitely makes my life easier. Gypsy is the last one to go into her sleep cage. Our ritual is for me to ask her if she wants to go nighty-night. Occasionally, she will put her head down but almost immediately her foot comes up and she steps up. I take her into the sleep room, ask her for a kiss, sing a little with her and then put her in the sleep cage. No problem. Once they have their bedtime snack, the first bird that I ask to step up is Nikki. Nikki is a female goffin I adopted in 2008. Nikki was picked up in a towel in her previous home because she had learned how to bite. What I realized was that Nikki bit when she did not want you to put her down so that situation was handled very quickly with a minute of singing and dancing before asking her to step off my hand. Nikki had some very curious stereotypy behaviours when I first got her. I would offer my birds some warm organic juice at night and Nikki would touch my hand, touch the lip of the bowl, touch my hand and touch the juice so that by the time she actually dived into the juice, it was cold. So I decided to count down from 5 and if she didn’t drink some juice by the time I got to one, I simply walked away. She learned very quickly. Then I wondered if I could use that for other behaviours. So when I ask her to step up and she doesn’t, I start the count down from 5 and 80% of the time, she steps up by the time I get to one and if she doesn’t, I just start the count down again and that takes care of the other 20%. I’ve never had to repeat the count down more than twice. Now how cool is that. It bears repeating that biting is a learned behaviour. The people who accept this behaviour from their birds is actually doing their bird a disservice. 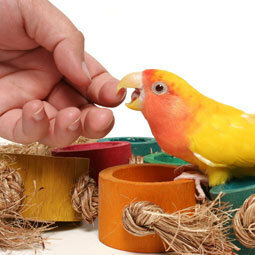 Isn’t it much better to learn how to prevent your bird from biting in the first place? I know many people who learned to “take the bites” and they no longer have those birds and that is not fair to the bird. It is very easy to get rid of an animal that bites you but when you take the time to learn how to avoid those bites and to set your bird up to succeed in your home, that is an amazing feeling and one we can all have. You don’t need to be a rocket scientist (if I can learn this, so you can you) to learn ABA but you must really want a better relationship with your birds and be able to commit to learning how to implement the tools of ABA in every day life with your bird. If you continue to blame the bird and not accept responsibility for causing the bites, you will continue to get bitten. Accepting a bite from a bird should never be considered a badge of honour. Why not focus on learning how to prevent your bird from biting in the first place? Biting and parrots are not synonymous as people would have you believe. Just because someone tells you that is the way it is, doesn’t mean it is true. ABA teaches you how to become the best avian caregiver you can be. Then you can teach other caregivers, and they can teach other caregivers and we can help parrots keep their homes. Now isn’t that worth working for?